Social media’s usefulness has been under a microscope as of late. With the attacks on professors Steve Salaita, Zandria Robinson, and Saida Grundy in the last year for their candid commentary on race, nation, and inequality (among other things) via Twitter, some question whether social media should be a part of the lives of academics or other public figures. It cannot be denied that Twitter is a significant component of public intellectualism. In fact, it can be a very important tool in the graduate student’s arsenal. Twitter serves as a great way to meet other scholars – graduate student and faculty alike – as well as share one’s work. 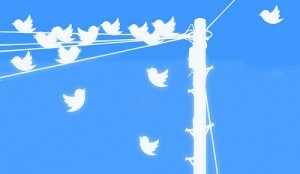 As Ekins and Perlstein (2014) argue, “Twitter can play an active role here to bridge or break down the gap between researcher cliques and can serve as a means to introduce you and your ideas to others in the field, without having to personally ‘know’ them.” Thus, participating in Twitter discussions and live-tweets of either pop culture or academic events provide the opportunity to weigh in based on one’s area of expertise and to hone the skills of clarity, directness, and brevity. Constrained by 140 characters at a time, tweeting, particularly live-tweeting, is an exercise in condensing information in order to share it with others. Live-tweeting at conferences has become a standard means of participating in discussions within and across sessions with various attendees as well as a way to share the happenings of the conference with the public. Last year in San Francisco, many sociologists tied in-session discussions to the protests in Ferguson, MO, with hashtags. 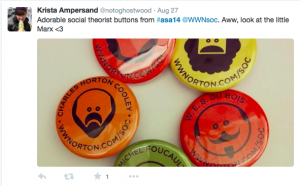 It was because of these on- and off-line conversations that Sociologists for Justice was formed, with a statement on Ferguson and a “Ferguson Syllabus” following shortly after ASA 2014 ended. On a more personal level, I have reaped several benefits from using Twitter, especially during my trip to San Francisco for my first ASA. Due to interacting over Twitter, I felt more comfortable approaching Professor David L. Brunsma at the panel he organized and via email after ASA ended. In fact, he is now a member of my dissertation committee. More recently, I was contacted by Professor Jessie Daniels (a UT Sociology alumna!) to write a blog post for Racism Review based on our on-line interactions and the “voice” I have cultivated on Twitter. I, and several other graduate students in our program, have made countless connections with scholars all over the country thanks to Twitter and I wholeheartedly believe in graduate students taking advantage of the space for networking and community support. So, as Chicago quickly approaches, I encourage everyone in the UT-Austin Sociology community to at least try out Twitter during conference time (the aforementioned Ekins and Perlstein have ten excellent rules to guide you). Not only will you likely make some new friends, you can follow up on your sociological idol(s) and share what you learn from panels and sessions with those who will not be in Chicago (or wherever you might be). ASA is already asking sociologists to share advice for first-time attendees, so a great place to start live-tweeting ASA 2015 is to use the conference hashtag (#asa15) and to follow @ASAnews. The conference hashtag and ASA’s tweets will not only show you what folks are saying and sharing from the various panels, but will enable your tweets to be cached with other attendees. Last year, nearly 18,000 tweets were sent out regarding #asa14 and @UTAustinSoc was right in the middle of it! Hopefully, we can keep the tradition going this year. I hope to see many of you (and your tweets) in Chicago! Shantel Gabrieal Buggs is the incoming editor for UTAustinSoc and a 5th-year doctoral candidate in the Department of Sociology. You can follow her on Twitter at @Future_Dr_Buggs.